"No, I'm not barking because of a neurological disorder. It's just fun." 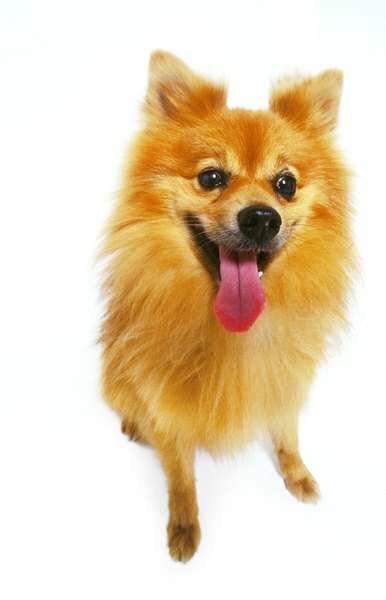 Neurological disorders in Pomeranians don't occur that often, with the exception of epilepsy. That's the most common nervous system disease listed as affecting the breed by the American Pomeranian Club. If your lovable little guy exhibits any problems related to his spine or brain, take him to the vet immediately. Epilepsy, or seizures, appears to be hereditary in some Pomeranian bloodlines. These seizures generally develop in Poms between the ages of 3 and 7 years old. If your little guy experiences seizures, it's a scary sight. Your Pom might fall over, loose control of bladder and bowels, salivate excessively and clench his jaw. The convulsions can last only a few seconds or a few minutes. Afterward, your dog might seem disoriented for an hour or so, although in some cases that phase lasts all day. If your dog suffers from occasional, brief episodes only, your vet might elect not to treat him. If the seizures become frequent, she might prescribe phenobarbital or a similar sedative to control them. You'll bring him back for regular drug monitoring. Less common than epilepsy, hydrocephalus, or water on the brain, usually occurs congenitally in Poms. That means they're born with the condition. But it might not become apparent until the dog reaches his first birthday. Spinal fluid accumulates, usually within the midbrain, because of an obstruction along its normal circulation route. Symptoms include seizures, head swelling, blindness, crossed eyes, constant vocalizing, odd gaits and sleepiness, although some dogs are asymptomatic. Your vet will perform a complete physical, along with blood testing and urinalysis, and an MRI or other type of diagnostic imaging so your vet can see what's happening in the brain. Poms with mild cases of hydrocephalus often live fairly normal lives. While relatively rare, syringomyelia primarily occurs in small dog breeds, including the Pomeranian. This disease affects a dog's brain stem and spinal cord, causing extreme pain. This congenital issue results when there's an obstruction in spinal fluid's normal flow pattern. It's obvious your dog is in pain, but that's not the only symptom. Others include frequent "phantom scratching," when your Pom scratches on one side of his body, never making skin contact. He might appear uncoordinated or experience seizures. Most affected dogs develop symptoms by the age of 1, although sometimes it manifests when a dog is older. Diagnosis is via MRI or a similar screening device. Your vet might prescribe pain medication, but surgery offers a good chance of recovery. While hypothyroidism is an endocrine rather than a neurological disorder, it's quite common in Poms, according to the American Pomeranian Club. Resulting from a lack of thyroid hormone circulating in the body, symptoms can manifest as neurological disease. These include loss of equilibrium and coordination, facial paralysis and hind-end weakness. Your vet diagnoses the disease by testing the thyroid levels in your Pom's blood. Fortunately, thyroid medication usually does the trick to get your little guy back to normal.